Whatever you use to marketing your wedding business – social media, wedding fairs, google – getting enquiries is only half the battle. You need to convert those leads into paying orders. So pay as much attention to your sales process as you do to creating that fabulous Instagram feed. 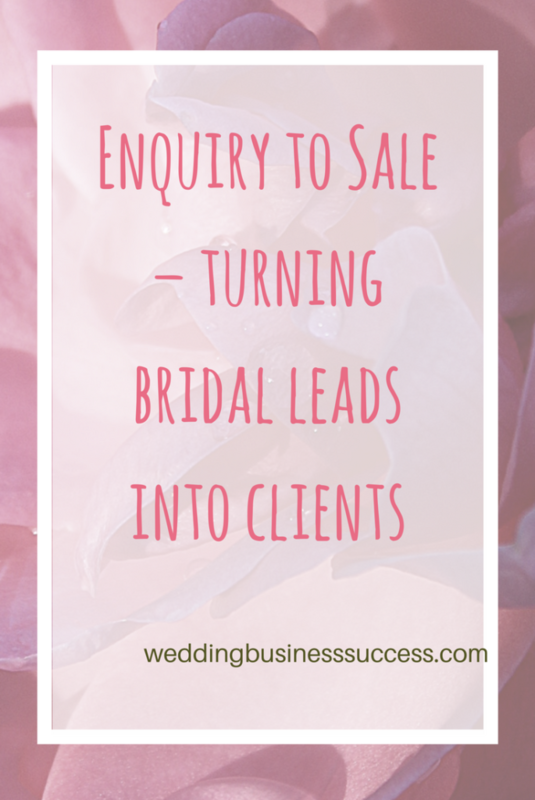 Do you track how many enquiries turn into sales? If not, then it’s time to start. By measuring the success of your sales process you’ll be able to identify weak points and areas you can improve. Record every enquiry, each communication and the outcome. And as you start measuring, patterns will emerge and you’ll see opportunities to make it work better. How do your customers buy? Understand how your customers make their purchase decision. It’s going to be different depending on your type of business and your ideal client, but think about your typical process. How do they contact you? Phone, email, text? Do they need to see (or taste) samples? How long do they take to make a decision? A few years ago wedding planners would generally arrange to meet prospective clients face to face. Brides telephoned to make an appointment at a bridal boutique. Today’s millennial couples are used to doing everything online. Think about where you could use technology. For example, offering Skype consultations, using online appointment booking systems. Do you sabotage your chance of making a sale? From the point at which someone comes across your business there are numerous ways you can stop them from getting to the point of making a booking. From hiding your contact details to complicated enquiry forms, if the first step isn’t easy, they will go elsewhere. What about your consultation process? By the time you get to a face to face (or Skype) meeting, you should be converting a high percentage into bookings. If not, you need to identify why and fix it. If you don’t believe you are worth what you are charging, they certainly won’t. Set your prices according to the value you bring and be confident about them. If they ask for a discount and you are happy to be flexible, then adjust the product/service accordingly. But don’t simply give in and knock 10% off your price. Finally, don’t be afraid to ask for the booking. It’s surprising how many business owners forget to do this. It’s not about being pushy – it’s helping the customer get one more thing sorted and ticked off their to do list. So when you review your marketing, pay just as much attention to your sales process as your lead generation. It will bring big rewards for your profits. Do you make it easy to buy?